I retired from advertising and marketing when my wife Helene thought I may still be fit enough to take on an adventure around the world. It was an itinerary for those of us of a certain age who prefer to turn left when boarding, choose a one-to-one specialist guide rather than a bus full, and enjoy a room with a sea view rather than one with a shared loo. 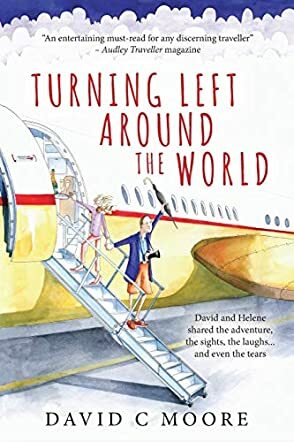 Turning Left Around the World by David C Moore is a travel memoir of David and his wife Helene’s experiences traveling to several countries around the world for almost a year. In this book, David writes about how the idea for the trip came up at the time of his retirement. The couple had traveled to Europe and Scandinavia before, so they decided to go traveling to other places around the globe where they hadn’t been yet. Thus, with the help of a travel agency to customize and plan their itinerary, their travel journey takes them across several continents and countries including Hawaii, the USA, Peru, Ecuador, Chile, South America, Australia, New Zealand, China, Vietnam, Cambodia, Japan, Myanmar, along with other places such as the famed Galapagos Islands, Easter Island, etc. This book details this journey along with a map of their route. I enjoyed Turning Left Around the World and David’s style of writing is just right for a memoir of this kind—funny, self-deprecating at times, and humorous, while also being instructive about the local cultures and traditions that they encountered and experienced. I also liked the numerous photographs that accompanied the descriptions of the countries they were exploring. I did feel, though, that this type of journey is clearly only for the wealthy. This travel is not “rough traveling” or “traveling on a tight budget” by any means, with its nice accommodations, personalized guides, and apparently business class transportation. So, this book is not meant as a model for the average person to emulate due to its cost, but even so, it is an entertaining read and a glimpse into the kind of traveling that is possible if one just has the means.